Blog What Pollinators are Buzzing around the North? What Pollinators are Buzzing around the North? Sault Ste. Marie (June 23, 2016): Sault Ste. Marie Innovation Centre’s Rural Agri-Innovation Network (RAIN) is assisting the University of Guelph with a pollinator monitoring research project looking at pollinators across Ontario. This project has created an opportunity to expand pollinator monitoring into Northern Ontario for the first time. National Pollinator Week is June 20 – 26, a perfect time to highlight this project in the North and learn about the valuable animals that help our ecosystem flourish. 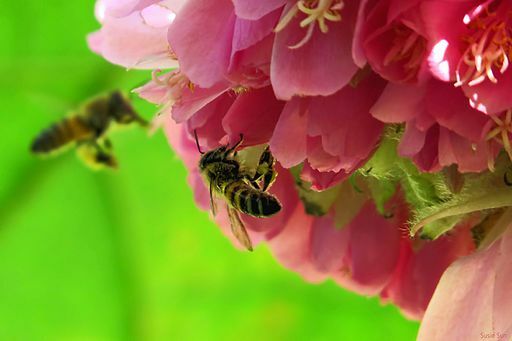 Pollinators include birds, bats, bees, butterflies, beetles, flies, moths and other small creatures that visit flowers. These creatures are an essential part of the world we live in, what we see, smell and taste. Without pollinators we wouldn’t be able to eat many of the delicious fruits, vegetables and nuts that form the cornerstone of a healthy, balanced diet. Pollinators are vital to the production of many healthy crops for food, animal feedstock, fibers, edible oils, medicines, and other products. This pollinator monitoring project is very important to help researchers understand and learn more about pollinators in Ontario and RAIN will help provide insight into the pollinators of Sault Ste. Marie and Algoma region. It will establish a baseline to better understand which species are found in the region, where and when these species are active, and contribute to a wider understanding of the current status of wild pollinator biodiversity across Ontario. “Given global concerns about pollinator declines, it is important to assess the status of pollinator biodiversity in Ontario, and how this is changing. This research will enable better decision making to conserve pollinators and manage habitat going forward” said Professor Nigel Raine, the Rebanks Family Chair in Pollinator Conservation at the University of Guelph and leader of this province-wide pollinator monitoring program. Raine is an internationally recognized expert in pollinator behaviour, ecology and conservation with 20 years of experience investigating bees and their intimate relationships with flowers on three continents. “My team at the University of Guelph is building a network of sites to monitor pollinators across the province. We are tremendously excited to be working with organizations like RAIN, volunteers, researchers and communities to examine pollinator biodiversity across the wide expanses of Ontario. Establishing these relationships is vital to the success of such a large-scale, ambitious and important project – we thank everyone involved for their enthusiasm and hard work,” he added. RAIN is coordinating volunteers in the Sault and Algoma area to assist with the University’s research. Throughout the summer and into the fall volunteers will set out an array of thirty pan traps – different coloured bowls to attract different flower visiting insects. Sampling will occur once every two weeks. On sampling day the pans will go out at 9:00 a.m. and be strained, bagged, and labelled at 4:00 p.m. RAIN will then pick up the samples and send them to Raine’s lab in Guelph for cataloguing and data analysis. RAIN will be collecting samples from a wide range of habitats, such as urban farms, farmland, forests, and wetlands. Sign up to receive updates about RAIN events, research and programs.